When Rich Rowe, one of the masterminds behind the Peebles Outdoor Film Festival contacted me shortly after finishing my epic round the world trip, I was excited and surprised in equal parts about the opportunity to headline the Sunday evening to close what looked like an exciting event to me. At the same time I was a bit nervous, and I got even more nervous when I arrived at the festival on Saturday to see award-winning cameraman Keith Partridge speaking about his adventures from the edge. That was the very same man that had filmed ‘Touching the Void‘, a movie that had a massive impact on me, a thrilling story of survival, world-class. Saturday was not only a cracking day at the festival, where I got to witness Ed Shoote‘s bikepacking stories in the afternoon, it was also a great opportunity to take Sean Conway for a ride around Glentress, not only introducing him to fat tyres and mountain biking, but also to ride a small section of the Capital Trail. It was heaps of fun, after a coffee at the Tontin Hotel we were off riding, the slightly miserable Scottish weather couldn’t deter us from having fun. With snow at the tops the trails were still in good condition to ride, and I got the chance to test my endurance riding up to Spooky Wood on a 32-18 singlespeed, which was perfectly doable. And it gave me that little bit extra speed needed to film Sean whenever I could, the result is a nice short video on YouTube and some lovely pictures. 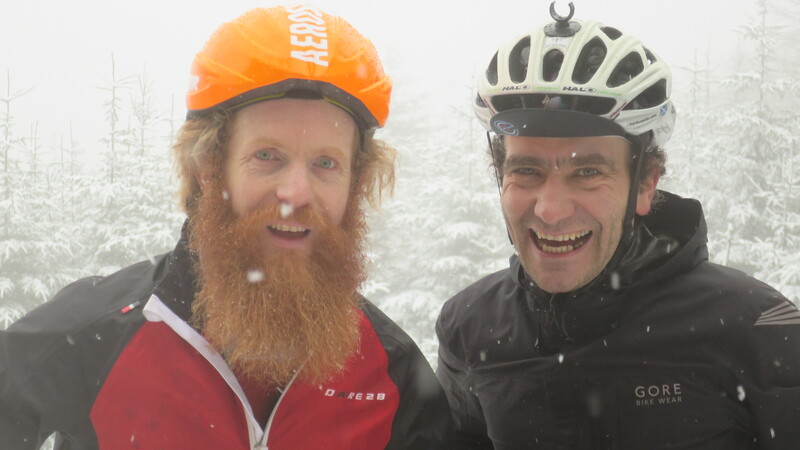 And having Sean hooked on mountain biking now, he’s welcome back anytime, it was an absolute pleasure to show him around. Ed’s account of cycling in Tibet was great, an while I am thinking about what’s next for me, that part of the world looks absolutely stunning for cycling. He was supported by a pretty big audience, overall the Eastgate Arts Centre was buzzing with people whenever I stepped in, a great thing to see so many people turning up supporting this wonderful festival. Having watched Keith’s tales from the edge the night before, I reworked my presentation for the night, also focussing on the great local mountain bike and bikepacking opportunities that Peebles offers. 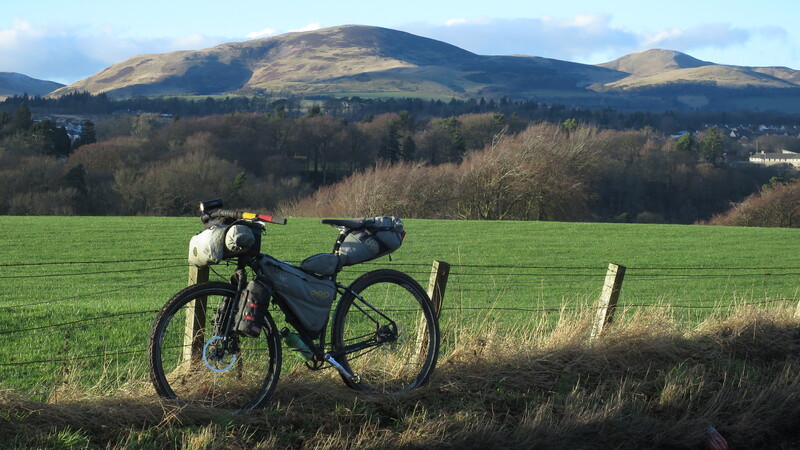 When the question how to get to Peebles came up in my head, I decided that I’ll make use of the cold but nice weather and take my round the world bike to Peebles, cycling all the way and back. To some this might sound a bit nuts, but to me it was a logical thing to do, it’s hard to convince people of the joys of cycling and the fun it brings, when you hop in your car for a 25 mile journey through stunning countryside. It was also great to get an opening picture for my talk, to demonstrate two key benefits of cycling, being able to stop everywhere and not having any barriers around me that would stop people from approaching. The beautiful background in the picture is yet another proof why we can call ourselves lucky to live in Scotland. 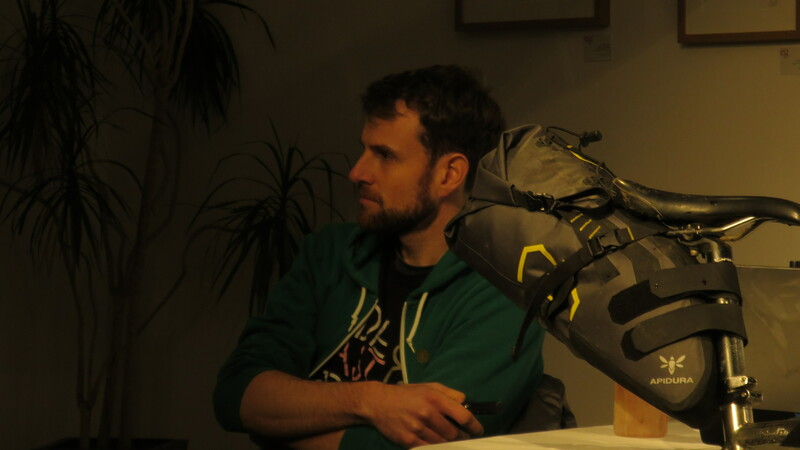 With all that in mind, the talk went very well, I really enjoyed sharing my passion for bikepacking and my tales from going round the world. It was great to have the bike for people to look at, while at the same time it was the best mode of transport to get me to the venue and back. 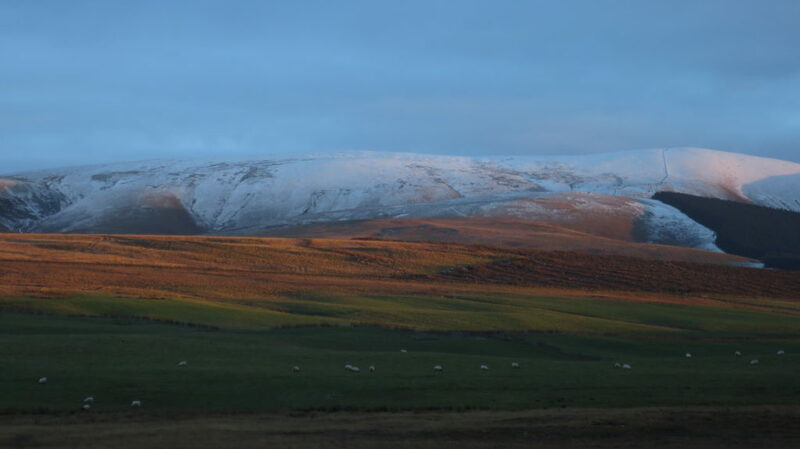 I got changed back in my cycling clothes, and off I was into the darkness back to Edinburgh. Arriving shortly after midnight I enjoyed the salad box Rich had given me as fuel for the way back, and went to bed leaving a great weekend to my memories and looking forward to much more. If you’re looking forward to hear more about my round the world adventures, please get in touch and have a chat, this presentation here will give you a flavour what to expect. And on that note, if you were in Peebles or sadly missed out, then please come to a talk I am organising with Tom and Rich Seipp, I have been following their efforts over the last three years, and look forward to a truly inspiring account of those on 16 Feb at 7pm at Craigdon Mountain Sports in Edinburgh. At the age of 11 Tom has ridden Strathpuffer three times, a 200 km gravel race and 3200 km across France on a tandem. All of this makes my cycle home in the dark look very tame. Tickets and more information is here.